I hope you are all doing well. How did you all enjoy your Labor Day weekend? I had an awesome time with my boyfriend and his family. We went to a great BBQ and I was stuffed-the food was so yummy! I am so happy the weekend is almost here. I am sure some of you may be aware that this Friday, September 10 New York is having it's famous Fashion's Night Out event in where clothing, beauty, and many other retail stores host special events and such. I am super excited because I may stroll on over to the C.O. Bigelow store in Manhattan located at 414 Sixth Avenue because Jersey Shore's Vinny Guadagnino will be making a special appearance from 7pm-8pm, and he will be talking about his favorite C.O. Bigelow grooming products. I think Vinny is a cutie, and it would be so fun to meet him :) Are any of you planning on attending Fashion's Night Out events here in New York? To see a listing of events in the New York City area, click HERE. In other news, when it comes to beauty products, it can be said that we all like to get a little bang for our buck. Therefore, we will sometimes invest in beauty kits or palettes that include many items. Not to mention, it is so much more convenient as well when your daily essentials are organized and grouped together in one place. Here are some of my picks when it comes to beauty kit treasure finds. Welcome to Beauty Crave. This paraben-free smokey eye kit is perfect for smokey eye lovers. It looks very simple to use as well. 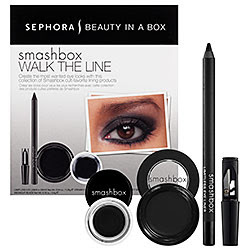 This kit from Smashbox includes the much raved about Jetset waterproof eye liner in Midnight Black, cream liner in Caviar, and the limitless eye liner in Onyx. Smokey eye heaven! This set looks gorge! Who besides me is loving the cheetah print on the bronzer? In this set we have a Lip of Luxury lipstick in Free Love which is described as a "pale pink" color, two Galaxy Glam Shadows in Amber Asteroid, and Magenta Moon, a mascara, a gloss, and the gorgeous bronzer. 6 items from Too Faced at just $40...yes please! It would have been nice if this set included the ever so popular Shadow Insurance. I have not tried that eyeshadow primer, but one day I will. I have never gotten my hands on one of Stila's Lip Glaze glosses. But this gorgeous set of 8 glazes for just $25? It is going to be pretty hard for me to resist. I already love Stila Smudge Pot liners, I am sure these lip glazes will blow me away. 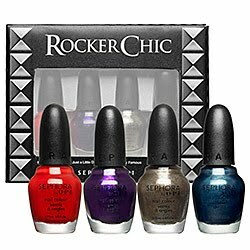 This set includes 4 popular shades, as well as 4 limited edition ones. 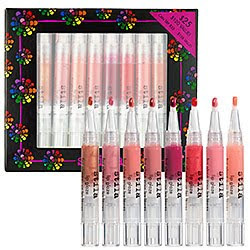 Have any of you tried Stila Lip Glaze? How do you like 'em? Fall is coming soon upon us and these 4 nail polish shades scream fall to me. That purple and red color are calling my name LOL! I do have one of Sephora by O.P.I. 's polishes and I do like the way they are applied easily on my nails. No streaks or air bubbles either. I wonder how these gorgeous shades fare up? I have read nothing but great things about the liners that Korres puts out. I love that these liner are 100% natural and free of parabens, sulfates, synthetic dyes, and many other ingredients that could be harsh for the skin area. This kit contains 10 gorgeous eye liner shades from your basic black, all the way to your bright pop of blue. I think this kit is a great value seeing as these colors are versatile and it allows one to play around with colors. I think this kit will be on my Sephora shopping list. 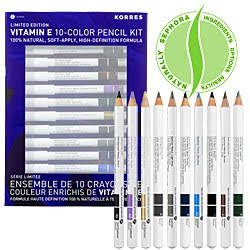 Have any of you tried pencils from Korres?